I have been working on two ideas off and on for the past eight months and I thought I would share them in one spot to help out anyone else who is also working through how to create personalized learning environments within their schools and districts. 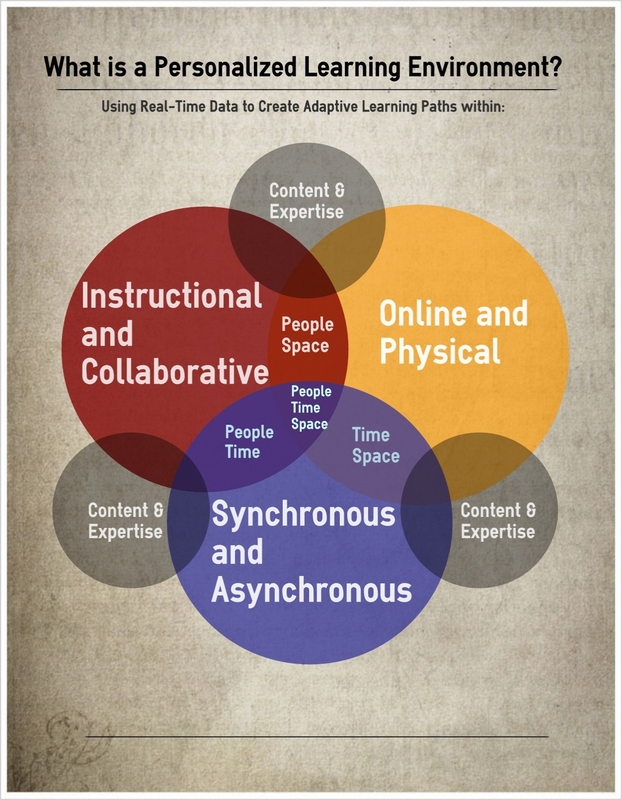 Essentially, I believe the learning environment we are all striving for is one in which the content and expertise are matched to learner needs within a choice-driven and data-supported adaptive learning path. The environment itself is based upon the intentional choices of the teacher and learner for when instructional and collaborative uses of people, online and physical uses of space, and synchronous and asynchronous uses of time are best suited for the learning experience. So, the activity we must pursue is in making our strategic choices within frame for each student in our care. The question we must ask ourselves is what is our “ands”, “ors”, and “withs” in this diagram. My hope is that these two things will push your thinking, but I believe that they only work when they are used and improved by the community. So, please think through just how these might work in your context. And thank you to everyone who helped my thinking along the way. Thought I might share some of my thinking with this community.